Alex Chediak has watched too many college students flounder over these issues and many others. Sadly, 45 percent of those who start off at a four-year college will not complete their degree. At a time when college has never been more expensive, too many of our children are failing. What makes the difference? Character, a strong faith, and a willingness to delay gratification. And where is that learned? Ideally, at home. 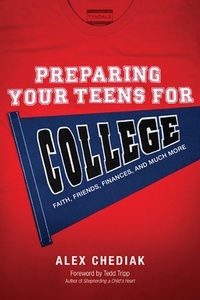 In this book, Alex will give you everything you need to help your teens successfully navigate the college years and beyond. Alex covers all the hot-button issues: studying, grades, time management, choosing a major, friendships, dating, what to look for in a college (and how to pay for it), God, and much more. You won’t want to be without this essential survival manual for college.